Wow – look who’s hatched! 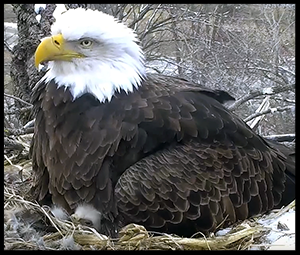 There are lots of chicks to see now – don’t miss the new addition peeking out from under mom in this Bald Eagle nest! Barred Owls in Indiana have three chicks! Thirty-three floors over Baltimore Peregrine Falcons have four eggs. Hatching watch starts after April 20th! Bald Eagles in Decorah, Iowa — all three chicks have hatched! Several Laysan Albatross families and chicks starting to get real feathers at this nestcam in Hawaii. The Lance-tailed Manakins in Panama are still performing during the day. If they aren’t displaying when you visit, keep checking back. Bald eagles in Channel Islands, CA with 3 eaglets! The Hellgate Ospreys in Montana are back! Iris returned on April 6 and was reunited with her mate Louis. Stay tuned….